“Failure to Launch,” “Delayed Departure,” even “Parasite Singles.” Media reports and varying degrees of alarm expressed to friends and relatives have cast a fairly negative light on what is becoming more and more common – college graduates and twenty (and even thirty) somethings moving back home to live with their parents. A trend that has long been familiar in Europe is proliferating in the US, especially today when jobs are harder and harder to come by and the price of housing hasn’t come down nearly enough to put it within reach for young adults. But is this a sign of moral failure on the part of parents? Or is it a rational response to the changes that the global economy has created? 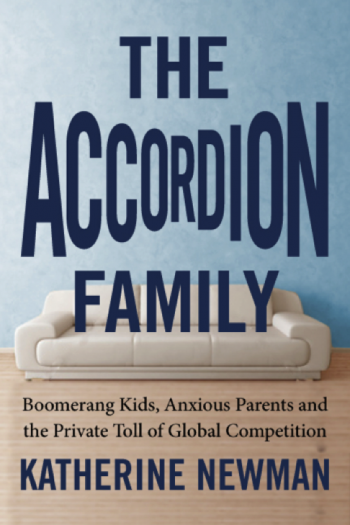 In The Accordion Family, Katherine Newman, one of the country’s most authoritative voices on matters of work, and family, suggests it’s a trend that is here to stay. Based on her research and interviews with families in the US and abroad, she urges us to set aside the derogatory language about slackers who can’t get their act together or parents who are too indulgent and recognize that globalization has fundamentally changed the nature of the family. Accordion families, which expand and contract as family needs evolve, are rewriting the relationships between parents and children, sometimes in surprising ways. Some of the changes are remarkably positive. When children live at home longer it often has the positive affect of keeping their parents more involved and engaged in the world. The notion of an “open nest” has expanded – families that make room for children today may well do the same for elderly parents in the future. The implications – positive and negative – of these trends are important and understanding the dynamics of this profound transition is essential for thinking about what lies ahead, for our families and for our economic well being. Clear presentation of a growing problem, its causes and consequences and the choices societies make. Newman reveals that while the causes of children moving back home are somewhat universal … different cultures have very disparate ways of redressing the issue. With the unerring eye and keen insight that has become her hallmark, Katherine Newman identifies a previously unexamined casualty of the new global economy—the prolonged dependence of adult children on their families. … The responses to this trend—social, political, and economic—will shape generations to come. Brilliant and important.